Alright guys... DJ Z-Trip coming to Elysium on July 21st... tickets are $10... which isn't too bad considering you got Nick Nack, DJ Tats and Thantos spinning too. Shout out to the S.O.B. 's, our Aussie's volleyball team, for winning tonight... hopefully we can keep this one game winning streak going. DJ Z-Trip (born Zach Sciacca) hails from the mashup school of hip hop, yet is fluent in many types of DJing, such as techno. A Phoenix, Arizona native, DJ Z-Trip became widely known over the internet when his collaboration with DJ P, Uneasy Listening, Vol. 1, was released in 2001. Only 2000 copies were made, but the album was soon distributed over the Internet in MP3 format. 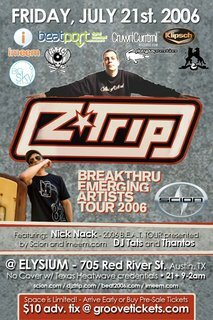 Z-Trip's most recent release, Shifting Gears, marked his major label debut. Released on Hollywood Records in 2005, the album features guest artists Supernatural, MURS, Lyrics Born, Luke Sick, Aceyalone, Mystic, Prince Whipper Whip, Busdriver, Chester Bennington (from Linkin Park), Chuck D (from Public Enemy) and Soup (from Jurassic 5).